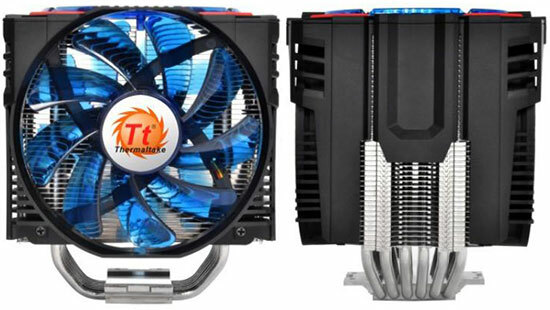 Since 1999 Thermaltake has been bringing us enthusiast grade computer accessories, chassis, and cooling products. In 2010 they released the original Frio, which was widely accepted as a fantastic cooler. Today we’re taking a look at one of the successors, the Frio OCK (Over-Clocker King). Priced at $79.99 shipped at Newegg, this cooler definitely seems to be aimed at the higher end of the enthusiast market. The Frio OCK is a dual tower style heatsink that features six 6mm heatpipes and comes equipped with two 130mm fans, which are controllable via Thermaltake’s attached VR fan controller. The included fans are capable of pushing 121 CFM at 48dBA, and they operate from 1,200 to 2,100 RPM. Unlike many other fans that are bundled with coolers on the market, the OCK’s fans are not PWM controlled. The fins on the Frio OCK are made of aluminum and are 0.4mm thick. The Frio OCK is compatible with Intel’s LGA 775/1156/1155/1366/2011 and AMD’s AM3+/AM3/AM2+/AM2 sockets. With a weight of 1093 grams it measures 143 x 137 x 158mm (LxWxH) with both fans attached. The Frio OCK isn’t exactly a small cooler. With this cooler being compatible with CPUs all the way up to 240 watts, it has to be fairly beefy. The Frio OCK takes a lot of its style and design from the popular PC game, StarCraft II. The top part of the fan shroud is designed to resemble a Terran Bunker from the game.